Research Centre Řež operates two research nuclear reactors, the safety of their operation has always been, and will be a clear priority. Part of the ongoing development in this area are meetings under the International Atomic Energy Agency (IAEA). 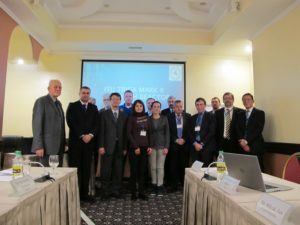 In December 2017, one of these meetings was held in Kazakhstan – the meeting of the Regional Advisory Safety Committee for Research Reactors in Europe (EURASC) – in which director of CVŘ Reactors Operation Division Ján Milčák presented the results of the LVR-15 reactor load tests and participated in a discussion with colleagues from other countries over the possibilities for further development in the safe operation of European research reactors.